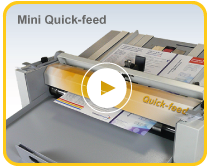 Based on the Mini Standard, the Mini Quick-feed includes a unique feeder system that allows you to process sheets up to three times faster. Easy top loading and a unique sheet separator allow you to feed continuously for fast output.Digital stocks can be prone to marking or scuffing because the creaser uses a vacuum pump during feeding. The Mini Quick-feed eliminates this problem with our innovative gravity flow feeder, which gently ‘kisses’ the sheets, making only minimum contact. You get a flawless crease every time because there’s no damage to any fibres.